Trichogramma ostriniae are tiny parasitic wasps that seek out and kill the egg masses of the European corn borer (ECB). The use of these wasps in commercial sweet corn fields in Massachusetts has resulted in the reduction or elimination of foliar insecticide sprays, saving time, labor, pesticides, and fuel, reducing soil compaction, and maintaining and improving ear quality. The good news is that Trichogramma wasps can also be used to control ECB in peppers. Trichogramma reduces fruit infestation, resulting in fewer culls and potentially greater success with high-quality, high value, ripe red peppers. In summer 2012, we conducted a series of Trichogramma releases at two farms in the eastern part of the state, and one farm in the Connecticut River Valley. We released Trichogramma from mid-July to mid-August, targeting the second generation ECB flight period and egg laying. Growers made 4 releases, one week apart. Our current recommended release rate in peppers is 90,000/acre on the first week (when flight begins) and 120,000/acre for subsequent releases. We came back at the end of the season to evaluate the success of control efforts. At each farm, we choose two varieties of sweet pepper (which tend to be more susceptible to ECB), and sampled 100-200 peppers of each variety. ECB trap monitoring was inconsistent through the growing period and when recorded, trap counts were variable. 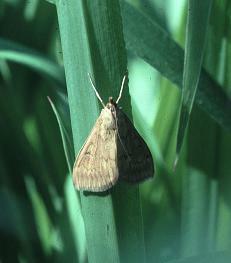 Because of this, it is difficult to estimate how high damage would have been without Trichogramma. However, Trichogramma appeared to offer good control of what ECB were present. ECB damage was 0% in peppers in the Connecticut valley farm, and at 0-1.2% and 2-4% at farms in eastern Massachusetts, which was lower than growers had observed in past years. We did find damage due to other causes, such as sunscald, anthracnose (see below), cracking and pepper maggot. We were surprised by the amount of fruit rot that was present even when there was no evidence of ECB entry holes under the calyx, and no sign of internal insect feeding -- 8%, 22%, and 23% of total harvest in the 3 fields. Some of the fruit rot we found in ripe peppers was diagnosed as anthracnose, caused by the fungus Colletotrichum coccodes. This is primarily a pathogen of ripe fruit, and most often occurs on fruit that has been left on the plant for a long period of time. It is common in tomatoes and eggplant. In peppers, it most often found on red or yellow peppers that have a long ripening period. Latent infections can occur on immature fruit. The pathogen can be seed-borne and survives in the soil through the production of sclerotia. Pepper anthracnose is relatively new to the pepper industry in the U.S. It is fairly widespread in the south and has occurred for two consecutive years in Massachusetts. Unlike C. coccodes, this species attacks fruit of all ages and is very aggressive. During favorable weather conditions, significant losses to peppers can occur. Saving seed from healthy fruit exclusively. Starting with certified, disease free seed and transplants. Planting in well drained fields. Rotating away from solanaceous crops for at least two years. Control solanaceous weeds. Remove all diseased plant material from the field. Most peppers are susceptible, but ‘North Star’ and ‘Paladin’ were the least susceptible in one report. Apply fungicides preventively where anthracnose has been a problem. Cabrio has performed better than Quadris for this disease. Azoxystrobin (Quadris), famoxadone plus cymoxanil (Tanos), mancozeb (Dithane), and pyraclostrobin (Cabrio) are registered for anthracnose on peppers.